Sunday is party day as the attention switches to Bruichladdich. Sunshine, music, cocktails and an air of spontaneity rule – but there’s some serious tasting to be done too. Martine Nouet reports. There is a tradition at Fèis Ìle: the sun always shines on Bruichladdich. Is it because the distillery open day is on a Sunday – the day no other distillery wanted to take when the programme was first decided in 2001? Or is it, as the Laddies like to say, because the angels are so especially fond of the spirit that they express their gratitude by ensuring the sky is cloudless? Maybe for both reasons. Anyway, 2016 was true to tradition. There was no need to take shelter in the warehouses. I even wonder if the laddies have a Plan B! The courtyard was absolutely packed from the opening at 12.30pm to the last tune at about 6pm. There is another tradition at Bruichladdich: the locals show up and have as much fun as the visitors, with whom they happily mingle. Bruichladdich open day is not about offering a large choice of classes or sophisticated entertainment; it’s all about having fun. And sharing it. The opening of the gates with the Isle of Islay Pipe Band – sponsored by Kilchoman distillery (more from them later in the week – Ed) – marching in is always an emotional moment. The huge stage at the back of the bottling hall is the main attraction all along the afternoon as music never stops. Skippinish, a well-known traditional Scottish band, are in the spotlight, but they share the stage with other excellent bands: The Maverick Angels, The Whisky River Boat Band and the Blueswater. Not to mention the local artists who get a warm round of applause. The Ella Edgar Highland Dancers, Angela Paterson and the line dancers also entertained in the most relaxed atmosphere. At one point, the public even came up on stage to dance, children included. 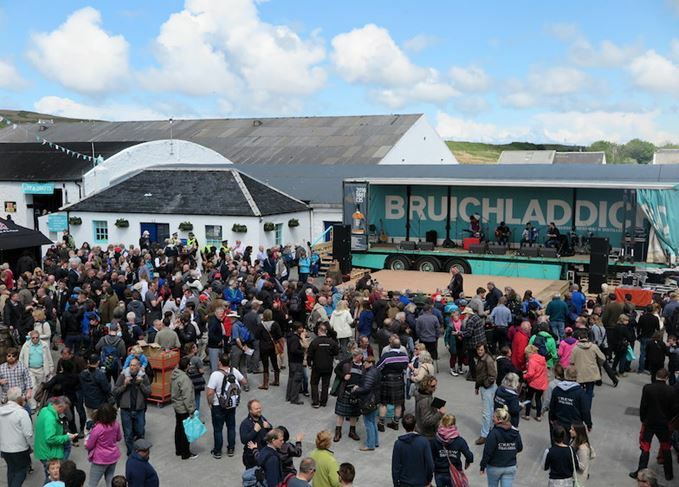 Bruichladdich open day is... very open! Children, babies in their prams and even dogs take part in the banter. You will sometimes spot a granny sitting in the sun and knitting while listening to a rock band. Or a bored puppy pulling on the lead while his owner is enjoying a pint with friends and totally ignoring his canine friend. The stage is not the only point of attraction, though, as the queue in front of the ‘dram station’ showed. The same goes for the beer tent, run by Islay Ales. And what to say of the magnificent decoration in the cocktail marquee? You had the feeling you were in a botanical garden or a greenhouse, walking among fresh herbs and plants, all included in the recipe for The Botanist Gin, which is distilled at Bruichladdich. Once you had your cocktail, you could pick up a few leaves of mint or lemon balm or another herb and garnish your glass. It was hard to choose among Ewald’s creative cocktails list, but I went for an Islay Fizz: Octomore barley-infused Botanist, Cointreau (you won't wonder why), foraged apple mint and sea buckthorn syrup (a novelty for me, but so delicious), lemon and soda. Refreshing, punchy and flavoursome. All that I was craving for. Hungry? You were spoilt for choice. The famous Gruinart oysters (available all week at every distillery), the no less famous Seafood Shack delights and the burger stalls run by local associations for fundraising. Raising money is a spontaneous impulse on Islay. It goes with the sense of belonging to a community. The last to appear on stage was Bruichladdich CEO Simon Coughlin, who auctioned some rare bottles of Bruichladdich, among them the Yellow Submarine release, raising up to £3,000 in two minutes for the sick children of Islay and Jura. So… no masterclass in Bruichladdich, only music and fun? Not at all. The ritual masterclass in the filling store up the hill started at 11am, before the opening, so that the audience (or maybe the class host) would not miss the party. In all, 235 people joined in. No, Adam did not try to stand in Jim's shoes. He fills his own with conviction and self-confidence. He quietly but surely took his audience through seven drams: the festival bottling to start with, distilled in 2001, a vatting of different casks in the Laddie tradition with a six-month finish (I did not hear the word ACE – additional cask enhancement) in virgin oak. Then two educational samples to illustrate the Bruichladdich focus on the notion of terroir: we tasted two different ‘works in progress’: one spirit distilled from Black Isle malted barley, and the other from Aberdeenshire. The first one was sweeter with cereal notes, the second spicier with berry fruit notes. Not sure this is enough to convince me of terroir, though, but that is another story. Then an impressive Sherry cask-matured whisky from 1990 called DNA, a designation which I found surprising as I tend to think that Sherry maturation does not allow the ‘DNA’ of the distillery to shine through. An excellent sample anyway, as was the 1988 Bourbon cask-matured Bruichladdich we were offered next. We finished with a PC13 – a good balance between fruit and peatiness – and an Octomore B/A Black Art. To sum up, Adam Hannett gave the audience an interesting overview of the experimental skills of the ‘Progressive Hebridean Distillers’, as Bruichladdich likes to be known. That reminds me. I stared for a long while at the esoteric label of the Feis Ile bottling: 2016-1881-135-PHD. The proof that I am not gifted at mathematics: 135 is simply the result of the subtraction of the two dates! Blonde moment? Most certainly. Barley variety’s effect on flavour is a hot topic, but Bruichladdich believes there are variations. Can the maverick Islay distillery maintain its independence after acquisition by Rémy Cointreau? Jura highlights its new single malt range, while Kilchoman shows off its new maltings. Unexpected pleasures – and predictable rain – at the Islay Festival’s annual double-header.